I use AVG Anti Virus. It is up to date. Twice in the last couple of days it has taken several hours to run a full virus check, both times finding nothing wrong. Do you think I have some sort of an issue here? Are you using the free version, if so it is notoriously slow, you probably do not need to run a full check every day, i do mine one a month.Try de-fragmenting your HDD, this should help. If you have Windows Firewall switched on, this will not help either, try turning it off. Hi Jocko, Under what conditions is the virus check being initiated? Are you manually starting it, or is it starting automatically? How big it your disk, how full is it, and when was the last time you defragged it? Edit: - I see Ray made some of the same points. AVG free is veeery slow, that's why I stopped using it. As long as you keep it updated then the real time protection should keep you safe, and there's no need to run a full check any more frequently than once a month or so as already stated. I'd leave your PC on overnight and do the scan then so it doesn't interfere. I use the free version of Avast these days, and whilst it nags a little bit it is quick and effective. Hi guys. Thanks. This is when I initiate the scan. It normally runs, automatically, once a week. My internet was slow so I ran a full scan and it took 9 hours. Normally it takes a matter of minutes. My hard drive is 750Mb - 675 usable Mb with 533Mb free. I run Windows 8.1, and in the 8 months since I bought the laptop I have never run a defrag. I don't have a lot going onto or coming off the hard drive. Just checked the defrag status and it is done, automatically, once a week. Disk status is fine. Perhaps it tried to run the virus check and the defrag at the same time. 750MB? Do you mean GB? Need to look at symptoms vs. cause. Was your internet actually slow or was it perceived to be slow through usage. Have you tried a bandwidth checker - I use this one: http://www.speedtest.bbmax.co.uk/ but others are available. If you PC is newish, I suspect it has more memory than this. First thing I'd check if the actual internet connection is OK, but the PC runs slow, is whether Windows can still see all your memory. I had a similar issue with my previous personal PC and it turned out a big chunk of the memory had become unaddressable and I had to get it replaced. You should be able to check your memory from the control panel. Sorry, I'm not familiar with WIndows 8 so can't offer any tips on how to do that - but you seem pretty computer literate to be able to work this out. Doh! Mind you, our first PC had a 1.2Gb hard drive and I remember saying we'd never ever fill it!! My first PC (Amstrad PPC 640) had 2 x 720kB floppies. My first PC was a 286 with a 20MB hard drive, but my first computer was an Acorn Electron. Everything was loaded by tape, I remember watching the numbers climb slowly in hexadecimal hoping it wouldn't fail right at the end and make me start it all again! Totally worth it to play Chuckie Egg and Elite though. Windows 8.1 seemingly does its own memory test but I eventually found how to run it manually and all 8Gb (7.78Gb usable) are fine. According to http://www.speedtest.bbmax.co.uk/ my internet is 1182.4KB/sec download and 286KB/sec upload. This is 3 mobile broadband. My first computer was a ZX Spectrum. I opted for the BIG 48KB model. 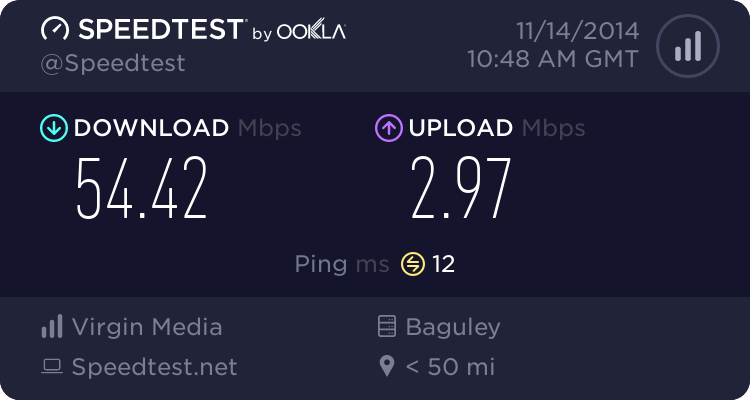 So do you still have the issue of your internet connectivity seemingly being slow or has it gone away? I also use 3 Mobile Broadband due to having unusable BT broadband to my house. I use a directional aerial connected to the dongle doodaa to maximise the signal as I don't have line of sight to a tower (3 miles away in a valley). My internet sometimes goes inexplicably slow for a couple of days at a time, or even disappears. I suspect that due to the fact I'm aligned on just one tower that when it has a maintenance window I don't benefit for any failover to adjacent cells. Sometimes atmospheric conditions affects it as well (heavy fog or hard rain). Still, the leaves are coming off the trees - usually faster in winter! If your signal is on the limits like mine you might have similar issues. You might have researched this already, but to maximise the signal if you find where your local towers are (I can dig up a website for you if you need it), placing your dongle near a window will definitely help. Use a USB cable rather than plugging the dongle into your laptop (or router) and hang the dongle from a fanlight handle so it's up against the glass. It is a wireless dongle and I have near the window but not against it. I get slow days and faster days. It also depends on the time of day. I think Mrs J's iPhone connects to it too so that doesn't help. I have no idea where my nearest 3 Mobile mast is. Found my nearest aerial. Unfortunately there are flats spoiling the line of sight. Current speed is 3 times as fast as it was at first and 90 times faster than Vodafone was. I disabled the iPhone and it made no difference. So it sounds like it was a transient problem rather than a hard fault then? Difficult to diagnose after the event. After all that, have you tried a Registry cleaner, sometimes the registry gets clogged up with all sorts of unwanted crap, go to http//www.tucows.com and search for "reg cleaners" there are a few good, free to download there. I normally do a full scan with security essentials around 30 minutes & a full scan with the MRT (malicious removal tool) again 30 minutes once a week. Virgin has an extra layer of security they throw in for free too, which has triggered two websites that were dodgy and refused to connect to them. I just did a speed test out of curiosity on my main PC & my old HP Compaq PC that I use downstairs for a media centre loaded with Linux Mint 16. My main PC is still getting over 54Mbps but my old one is getting just over 6Mbps! Went to Tucows and got Reginout System Utilities. When I ran it it found 2316 errors! Corrected them, so I will see how I get on with it now. Thanks.